A central street with many excellent shops for window shopping or browsing. A fine selection of coffee/tea shops. The building which houses Crabtree and Evelyn was once a gaol with a cage for the prisoners on the outside, this later became the home of Shakespeare's younger daughter, Judith. 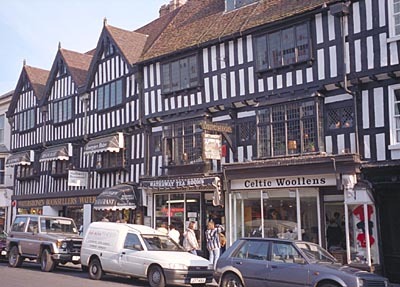 Further down High Street on the same side you will find a black and white timbered building housing Marlowe's restaurant quite well established having been 'newly built 1595'. Further down on the opposite side take time out to look at the architecture of a beautiful carved house with the date of 1596 on it. This is Harvard House, one time home of John Harvard, the founder of Harvard University. Both buildings were rebuilt after a very bad fire and it was this fire which made the local authority at the time ban thatched roofs in the town.